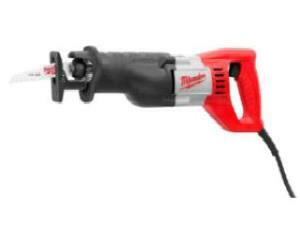 A sawzall is used for cutting a variety of materials, from metal to wood to fiberglass, it can handle nearly anything. It features a tool-less blade change, a counter weighted mechanism to reduce vibration during cutting, and a 1 1/8" stroke length to provide maximum cutting speed. Blades are sold in-store at an additional cost and come 6" and 12" lengths. * Please call us for any questions on our sawzall reciprocating saw rentals in Hillsdale and Ridgewood NJ.